Kitchen & Cooking Tips & a Giveaway! Here are some good ideas I have collected from bloggers and readers over the years. 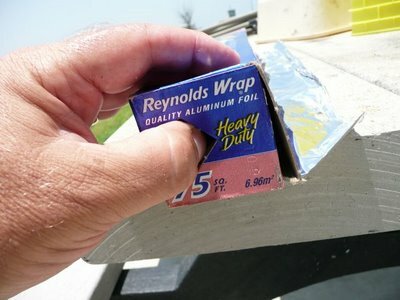 Look on your aluminum foil or plastic wrap box. There should be 2 tabs on the sides. Press in the notches, this keeps the roll in tact! Go figure. Don't you hate when your brown sugar gets hard? 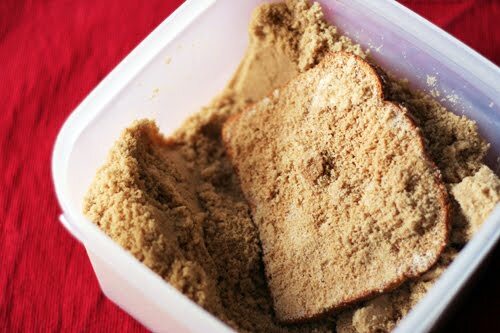 I usually put it in the microwave to soften it up, however, did you know that if you store a slice of bread in the bin with the brown sugar it lasts forever? and the bread never gets moldy, I swear. (You can also store a marshmallow in the bag, but I never seem to have marshmallows on hand). It's always such a pain cutting up strawberries to use in cakes. How about using a straw to hull strawberries???? Genius! 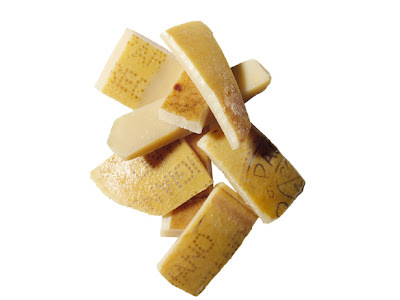 Save your Parmigiano Reggiano cheese rinds (they stay forever too). Throw them into stews and soups that are simmering a long time. The rinds melt and become soft and gooey and make everything more delicious! and last, MY favorite tip (or rule!) is: if you are having a dinner party or cooking for someone special, whether it's your boss or a date — never try a new recipe or ingredient that you are unfamiliar with. Stick with the tried and true. (been there, done that!). Tell us your favorite kitchen tip and 2 random winners will win the book Good Food to Share by the author of The Kitchn blog, Sarah Kate Gillingham Ryan (that's a mouthful)......where that yummy Caesar deviled egg recipe came from. If your kitchen scissors seem dull, cut a piece of steel wool with them...it'll sharpen them up! When only processing a few ingredients in the food processor, put all the ingredients into the bowl, put a piece of plastic wrap between the bowl and the top piece and whirl away! After you're done, you only have to wash the bowl and the blade as the top is clean as a whistle! When using chipotles, take the remaining peppers and adobe sauce and partion it out in an ice cube tray. Freeze. Pop them out and put in a freezer bag. Easy and accessible next time you need one or two. Clean your waring blender without taking it apart... add a drop of dish detergent and fill 2/3 with water. REMEMBER TO PUT THE LID BACK ON, and run for 10 seconds. yYu will never again slice a finger while takng apart the blade attachment. These are awesome tips. I've been cooking steel cut oatmeal in a slow cooker and then freezing individual portions in a large muffin pan - works great! When boiling eggs, add in 1/2 cup salt. Shells slip off with no problem! After juicing a lemon I cut up the peel and store with kosher salt. After several weeks the rind becomes tannish and super flavorful when a teeny bit is added to anything that you would add lemon to. Keeps forever...and you keep adding more peel. I also keep dish soap in a pretty pump bottle by the sink. One squirt and dishes are done, plus it looks pretty. Can't find wonton wraps at the store, buy eggroll wrappers. Cut them into 4 sections. Now you have wonton wraps. All of those are great tips. Love saving jars. Now the non-moldy bread in the brown sugar? That's new! It doesn't get moldy... pinky-swear? To get rid of fridge smells, cut a lemon up into big chunks and sprinkle salt and baking soda on it. Leave it in the fridge for four hours, and remove. Only eating half an avocado, but don't want the other half to go bad? Store it in a container with the fruit submerged in water (no lemon juice or any other preservative). I use this method multiple times per week and store the avocado for up to two days. A small amount of the fruit disintegrates, but it's overall texture is good and there is no browning! Ripe avocados will last longer in the fridge if wrapped in aluminum foil. We usually use only half at a time, so the other half (seed in place) is wrapped in plastic wrap and put back in the piece of foil. A housekeeper from Mexico taught me this years ago. Strawberries and blueberries that come in the plastic clamshells will stay mold-free in the fridge if you fold a half sheet of paper toweling (or a whole sheet if it is a large clamshell) and place it in the top before closing the lid. Put the whole thing in a slightly open plastic bag, the kind they have in the produce department. 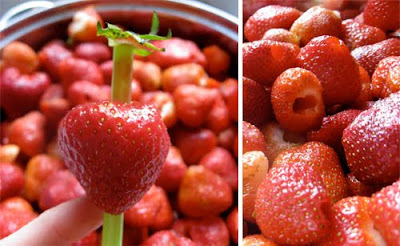 Pull out the ripest strawberries as you go along, and remove any that look iffy. Once in a while a blueberry will show up with a tiny bit of mold at the stem end. Discard it! This seems fussy but both avocados and berries can be pricey. I buy larger quantities when they are on sale and these storage methods keep them in good condition. Meant to put my name on that last post about the avocados and berries. I'm Bebe. To clean cast iron skillets just rub out with course sea salt! Great tips! You can also pop a marshmallow in the bag with the brown sugar...works the same way. To avoid bitter cucumbers, cut the ends off and rub them on the opposite ends...it really works! To easily peel a garlic clove, give it a good 'whack' with the side of a large knife and the peel will come right off. Love reading all these tips! Freeze all your chicken bones/carcasses , make stock when you have enough , great blog Stacey . To keep brown sugar soft, I just drop in a small folded piece of paper towel that has been very slightly moistened. The new plastic bag packs seem to keep brown sugar soft for a longer time than the old wax paper-lined boxes did. When all else fails, order in . . . Throw some vinegar in the boiling water when making poached eggs to help keep everything together. Also - when storing guacamole, always press the saran wrap down onto the surface to minimize oxidation. I'm enjoying all the tips, but I got a real laugh out of StaceyEsq's idea. Here's another one: If you have ants coming into the house through a hole, fill the hole with vasoline. If you need to roll dough out place it on parchment that is secured to the counter with painters or masking tape. Then peel the tape off and you can transfer your dough to the pan or a different surface on the parchment. The parchment will just peel right off. Minimal flour is used which means minimal mess! Love all your tips and everyone's along the way. When I cut up celery and carrots to munch on I wrap them in a damp paper towel, put them in a zip lock bag and it keeps them fresh for five days. No need to cut them up when you need a snack! When making soups chop up a tomatoe and add it to the pot. It will stop the foam that collects around the edges of the pot. I love iced coffee on a warm evening but hate how it waters down when you pour hot stuff over ice. I even tried the "freeze coffee in ice cube trays". Now, when I make coffee in the morning, I make twice what I need and put the rest in a container in the fridge. And if I've remembered to make a ice cube tray-ful of coffee, too, bonus! Like fresh ginger but sick of discovering a withered root just when you do need it? Find a jar just big enough to fit. Put the root, skin and all in the jar, don't crowd it. You can break the ginger into pieces which I do since I use a grey poupon style jar. Pour an inexpensive dry sherry (it doesn't leave an aftertaste by the way) into jar, enough to cover ginger, screw on lid and keep in fridge. I've been doing this for years. Ginger kept this way, lasts for at least 3 years in my experience. When needed, take it out break off a piece, rinse and voila, fresh, plump ginger. I store lefover pesto in ice cube trays so that I can just take out a cube or two when I'm making pasta! When you don't need the whole can of tomato paste...freeze It by the teaspoon on a plate. When frozen just bag them up and keep in freezer. They work great in soups and sauces. 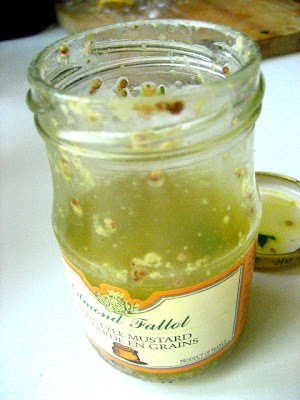 WOW...great ideas...can't wait to try the mustard in a jar for dressing one. When I find my favorite brand of yogurt on sale (right now it happens to be Liberte) I buy up a whole bunch and freeze it, in the containers it comes in. When I want one, I put it in the fridge and it really does taste the same. I have done the same for hummus. I use an immersion blender to make small volumes of salsa. If you like to make your own bread with whole wheat flour but it comes out too tough, replace the water with beer or wine, it tenderizes the bread so you have a soft loaf! 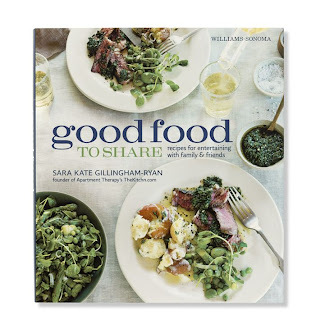 The cook book looks great and I really hope I get one! Anyway, my two fav kictchen secrets: stinky bacteria laden sponge? throw it in the microwave for 20 seconds - it kills the bacteria and makes it tollerable to touch (just don't touch it right away as it'll be blistering hot!)! My other tip involves mayonaise! It's the BEST for removing the goo left from price tags or for removing any kind of goo for that matter! It'll also reshine the surface of a pot. In either situation, dab a bit on, rub over the offfending site and wipe it off using mild dish detergent or if it's a glass surfave - windex! To clean spillovers from a black glass cooktop make a paste of baking soda and warm, soapy water. Cover with damp rag and wait 15 minutes then wipe off. Love the suggestions! For those who make homemade pizza, be sure to preheat your pizza stone for 20 minutes at 425 prior to baking. This insures a crispy, well-baked crust. Wrap fresh herbs in damp paper towel to keep for a week in crisper. Re dampen as needed. My tip was going to be to put your fresh ginger in a jar of dry sherry in the fridge but someone else came up with that one. Another thing I do is wrap my celery in aluminum foil and it keeps way longer in the fridge than in the plastic sleeve it comes in. Any left over wine is poured into ice cube trays, frozen, to add to marinara sauces and soups to enhance flavor. Keep some wax paper on hand in the kitchen. It's great to use you're coating chicken with crumbs because you can use the paper to push crumbs to the top of the meat. My friend swears by pouring some white vinegar into the bottom of her dishwasher before she runs it. The glasses come out sparkling! I only have one good kitchen tip, the result of an epiphany I had while emptying the last of my morning cereal into a bowl. That plastic liner inside the cardboard box? It’s gold. Companies have spent hundreds and thousands of dollars developing that plastic liner to make sure it’s lightweight and capable of keeping crisp things crisp. So go ahead and recycle the box but gently detach the liner and reuse it. It’s a great way to store cookies, breadcrumbs and crackers for your cheese. Honest!